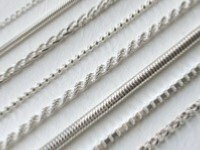 One of the most frequently asked questions is, "What length chain do I need?" We are all different shapes and sizes so it's not surprising when faced with a choice of 14" to 40" lengths, many people don't know where to start. Fashions go up and down so some years a choker is the thing to wear and others, a belly skimmer is the must have. Consult our guide to choosing the right length chain and get it right first time. Once you know the length you need, it's time to shop for your silver chain!